Chandra Medina is a local author, life coach, minister and a single mom of three teenagers. She is active in her community living her passion of helping youth and empowering families. She is founder of the Spiritual Awakening women's conference and author of Taking Back Our Children: A Parent's Introduction to Spiritual Warfare. She continues to mentor and minister in the areas of healing and deliverance, helping individuals break the cycles of destruction in their families. Chandra's biggest passion is to see the Kingdom of Heaven made manifest here on earth. She is absolutely in love with Jesus and everything connected to the Kingdom. Through a lifetime of abusive relationships and what seemed like a never ending cycle of self destruction, God has restored her to a place in His love that has sparked a passion to help be a minister of that love and freedom to others. She loves to equip the body of Christ, calling out and coaching individuals in their spiritual giftings, training them on the secrets of spiritual warfare and spiritual empowerment. You will find Chandra on a mission to empower God's people through You Tube and one on one coaching bringing understanding of the Kingdom of Heaven and how to bring it to it's full manifestation here on earth. This book is really an introduction to spiritual warfare for anyone who has ever battled with evil spirits. Chandra Medina begins by quoting various scriptures from the Holy Bible about the spiritual realm. Matthew 10:1, "He (Jesus) called his twelve disciples to him and gave them authority to drive out evil spirits and to heal every disease and sickness." I sincerely believe, and the Word of God confirms it; that evil spirits and sickness go together. Many people treat only the sickness of the body and neglect the sickness of the spirit. 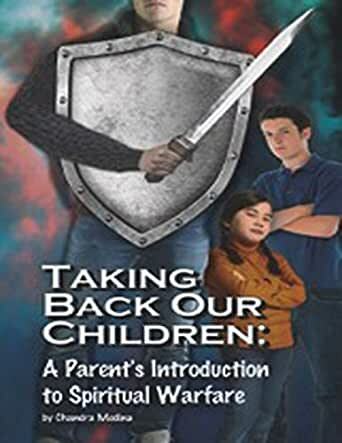 In the book, the author details things a parent must do to take back their children from the influence of the demonic. I agree with her steps that she outlines in her chapter, "Cleaning House." First, go throughout your home and remove all demonic influences that may be in books, music, video games, and other items. Second, pray over your home taking back what belongs to the Lord. Third, pray over the rooms and the individuals in the home in earnest and sincerity. Fourth, be grounded in the Word of God and teach the children to pray. Also, be involved in what the children watch and do inside the home. Really it takes a prayer of authority over the demonic and a true believer to accomplish it. This is just an introduction to spiritual warfare, actually this short book never covers the Armor of God, found in Ephesians 6:10-18. I must emphasize that Chandra Medina states, that she became serious in her Christian faith and this changed everything for her. A lukewarm believer who is not committed to Christ is not a threat to the enemy. Spiritual warfare begins with a true, sold out, servant of Christ Jesus, who can battle the spiritual realm correctly, in the armor of God. However, the reasons for the low rating are two-fold: I disagree with the books interpretation of the scripture from Ephesians 6:12. She interprets "Principalities are a sovereignty or ruler of a jurisdiction...Powers are influences over the thoughts and emotions of humans. Some of these are Offense, Lust, Greed, Bitterness,...Rulers of Darkness are the deceiving culprits of false teaching, false doctrines, religion & the occult. Spiritual Wickedness...are the impish havoc-wreakers. They cause accidents, pre-mature death, suicide, delayed blessings, unseen obstacles, and hindrances to progress..."
I do not agree with these divisions because it is not in the Bible, it is mere speculation and not accurate. The writer needs to back up these points with accurate scriptures, for it to be stated as truth from the Word of God. One must be grounded in truth to fight a lie, for this you need to know the Bible. My second negative, had to do with her description of Beyoncé, Jay-Z and Kanye West, She goes into great detail about the demonic influences of these individuals which is unnecessary. The book needs to remain focused on the truth and not glorify the demonic. These are secular artists who obviously do not love or serve Christ. We do not need to know who they are at all. This book has some excellent points. As parents we need to be aware of the devils sneaky way of attacking our children. This book is short and to the point. 5.0 out of 5 starsAn Must Read!! A book filled with important information on warfare strategies to save our children from the enemy! A great read for such a time as this! I highly recommend this book. This book is so powerful that I feel like a Holy Warrior Woman!! She gets right to the point and stays there from start to finish. A serious must read for families who are struggling with their children and homes. Thank you so much Chandra Medina for sharing this!